Meghan Dillner had been knocking on the door this season for her first Pro Challenge Series victory of her career. 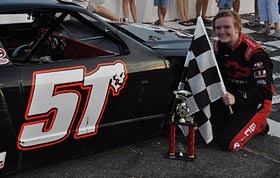 Dillner had scored two-straight, second-place finishes in the National Point events so far in 2009 and was a favorite going into Saturday’s North Region National Point race at Hickory Motor Speedway, but few outside of Dillner’s BDI Racing camp expected the kind of dominance that she put together at HMS. Dillner qualified on the pole and led every lap in dominating fashion, despite constant pressure from various challengers, to put her first mark in the win column in a Pro Challenge event. “We’ve raced several times here before, but it’s incredible to win here because I love this track,” said Dillner. “I had two different cars behind me that were pretty quick. I had to battle with them all race long, but hey, that’s racing and honestly, it made the race more fun,” said Dillner. Dillner had to hold off hard-charging Montana native, John Hilliker for the race win. Hilliker was the second driver in the 30-lap feature to put the pressure on Dillner up front. Stephen Bergh Jr. qualified on the outside pole and tucked in behind the 15-year-old Dillner at the start, but quickly began putting the pressure on Dillner. After several attempts at the lead, Bergh spun out of second in a battle with Dillner, allowing Hilliker a chance to catch the lady racer. Hilliker put the pressure on Dillner throughout several restarts, but was unable to make the pass. Dillner, who is running for the National Points Championship could not have had a more picturesque race for her points’ run. Dillner was followed to the checkered flag by Hilliker, Kyle Benjamin, Bergh and Trevor Edwards. The next Pro Challenge North Region event comes on Wednesday, July 1st, at the quarter-mile track at Concord Speedway in North Carolina. The final regular-season National Point event for the North Region comes on Saturday, August 8th, at Orange County Speedway (NC). Dillner (#51), Bergh (#70) and Hilliker (#34) battle for the lead at Hickory.